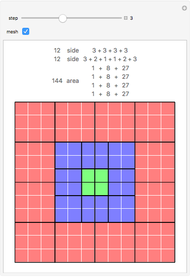 Nicomachus's theorem states that , where is a positive integer. 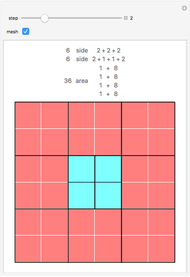 In words, the sum of the cubes from 1 to is equal to the square of the sum from 1 to . For a visual proof, calculate the total area in the figure in two different ways: First, count the unit squares from the center to an edge to get , so that the total area is . Second, consider that each square ring consists of squares of side , with area . 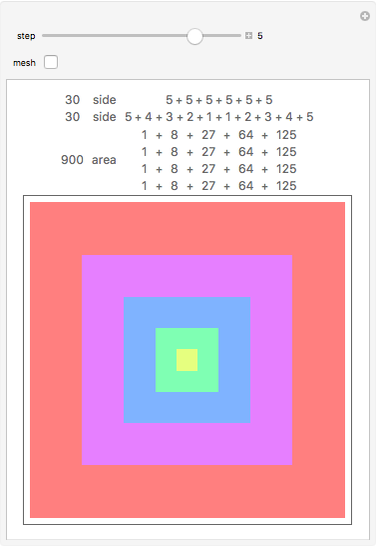 Michael Schreiber "A Visual Proof of Nicomachus's Theorem"